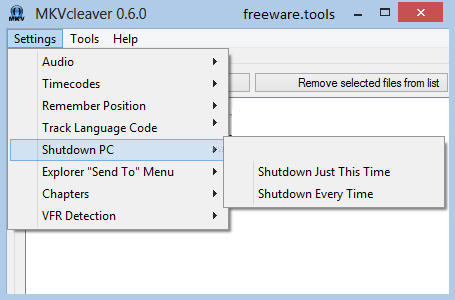 MKVcleaver is a GUI (Graphical User Interface) portable tool used for MkvToolNix, designed to extract data from MKV files. It can be used in a batch mode (loading and extracting data from many files) as well as single file mode. Features include drag and drop support, per file setting override, detailed information for each file on demand, file naming options for easy sorting, language tag for audio and subtitle tracks, aave files to original directory or select a single directory and much more. No installation is required to use this tool. Extracting tracks from video files isn’t such a difficult task if you use the right tools. As the name suggests, Portable MKVcleaver is a program that only works with Matroska files. The program has a simple user interface that is quite easy to figure out. You can load the files by browsing the directories for them or by simply dragging and dropping them into the interface. Once the files are in place, you can view all the items it includes, such as the video and audio tracks. If available, subtitles are also displayed. An output directory must be defined, as well as several other settings, like the file name format and the video options. Since the utility also supports batch processing, you can select the tracks that you want to extract from all the files. For instance, you can choose the video and audio tracks, attachments, time codes, cue sheets, chapters and tags. Furthermore, it can shut down the computer when a certain task is complete. Also, it can detect the variable frame rate (VFR) and track the language code. The entire extraction process doesn’t take very long, but it depends on the size of the video and the number of files in queue. The program supports only Matroska files, such as MKV, MKA, MKS and WebM. Since the app is portable, it doesn't need to be installed on the computer and it shouldn't leave any traces in the Windows Registry. The bottom line is that Portable MKVcleaver is a nice program with a very simple interface. Inexperienced users should find it easy to work with, thanks to the app’s overall simplicity.